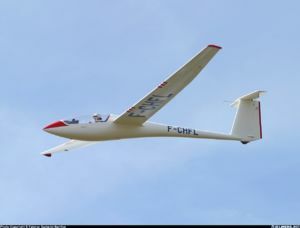 A Pegase spotted over Chambery-Challes-les-Eaux, France. The Centrair C101 Pegase is a Standard Class single-seat glider manufactured by Centrair starting in 1981. The design uses a ASW 19 fuselage with a new wing, giving better performance than the German original. This page was last edited on 6 March 2007, at 01:35.